The brief from the clients was to design a modern garden with street appeal to match the newly designed architectural house. While offering privacy from the street and not taking away from the harbour views screen plants with restricted heights was critical in the plant selection. 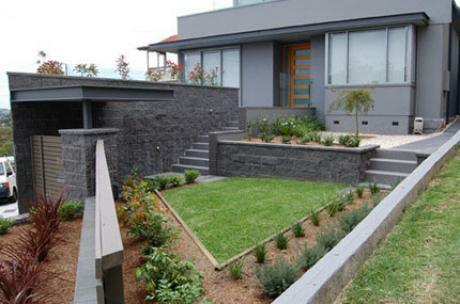 With an inclined block, a three tiered contemporary garden was designed. A timber slatted fence and gate formed privacy and security from the street. The low maintenance garden was designed using water wise plants, a small area of grass and decorative pebbles added the finishing touches. A Weeping Japanese maple was chosen to feature at the front entrance which emphasized with the decorative pebbles and curved garden bed.